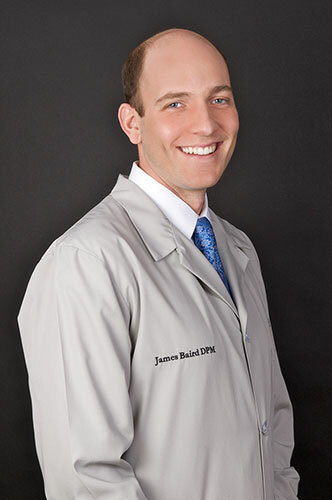 Dr. James Baird is committed to excellence in general podiatric medical care and reconstructive foot and ankle surgery. He partners with his patients to find the treatments that will serve them best. The doctor’s special interests include the treatment of pediatric conditions, sports injuries, and diabetic foot and ankle conditions. After attending the University of Wisconsin-Madison, Dr. Baird graduated with his Doctorate from Dr. William Scholl College of Podiatric Medicine in Chicago. He completed his surgical Residency at Mt. Sinai Hospital Medical Center, an inner city trauma center in Chicago. Dr. Baird is Board Certified in Foot & Ankle Surgery by the American Board of Podiatric Surgery. Dr. Baird is a Barrington High School Alumni and is active in the community through a number of organizations including, Barrington Breakfast Rotary, Barrington Area Council on Aging, and the BHS Alumni Association. In Dr. Baird’s free time he enjoys spending time with his wife and children, running, and boating.